View More In Lunch Bags - Page 8. We have created lunch- and sandwich bags that keeps your food fresh, delicious and appetising. The best part is that we all start limiting the use of non-recyclable plastic bags, with our food-safe non-toxic, phthalate-free, lead-free and BPA-free sandwich bags. 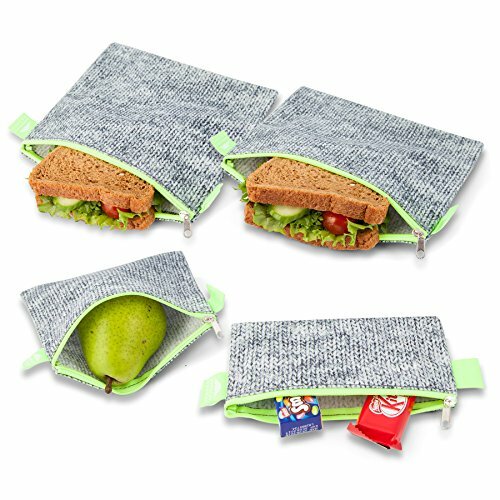 This sandwich pack contains a set of four gourmet reusable lunch baggies: Two extra large sandwich bags (7.0 inches x 8.0 inches), a large sandwich bag (6.5 inches x 6.5 inches) and a snack-bag (6.5 inches x 3 inches). Mix and Match our set of sandwich bags with our Nordic By Nature insulated lunch bags. Not only does our Lunch Totes have similar great Danish Design, they will also stick out in the fridge and easy to find. Buy the lunch bag and the sandwich pack together, and receive a discount. See more in the pricing options section. Who needs paper or plastic? With our reusable sandwich bags, you can safely store sizeable sandwiches and other food, and enjoy their fresh, full flavour at your convenience. All without adding more trash to local landfills. If you're not thrilled with your Nordic by Nature Lunch Pack, send it back within 60 days for a full refund of your purchase price. Order Now for Yourself & Your Gift List! ECO-FRIENDLY AND REUSABLE - Nordic By Nature sandwich bags are non-toxic, phthalate-free, lead-free and BPA-free. Made from cotton fabric and food-safe polyester which gives you the perfect solution to keep your food healthy, fresh and safe. No more regular plastic bags, enjoy our recyclable food bags. VALUE FOR MONEY - This set contains four sandwich bags, which is more than you see most other places. Furthermore we provide the best customer service possible, and with our 'No Questions Askes' return policy, we will always help you out if there is ever a problem. If you have any questions about this product by Nordic By Nature, contact us by completing and submitting the form below. If you are looking for a specif part number, please include it with your message.